This means new buyers with potentially new aspirations for the site. Despite 151 public submissions against the larger guesthouse proposal. Injidup Guesthouse Size Increase : "Economic Viability"
Council invites public comment on the following development application which is presently under consideration: PROPERTY: Location 1351 Wyadup Road, Yallingup PROPOSED DEVELOPMENT: 10 Suite Guesthouse Plans and details of the proposal may be viewed at the Council Offices, Southern Drive, Busselton and the Busselton and Dunsborough Libraries during opening hours. Persons wishing to make submissions should do so in writing to the Chief Executive Officer (quoting Reference No. 4603) prior to close of business Thursday April 3, 2003. The Development applications are available for viewing and commenting on by contacting the Busselton Shire. If you are outside of the Shire you can e-mail or phone (08- 97 810 469) for information and quote the reference number 4603. The planning department will post you the details. "The lots have been carefully selected to be relatively inconspicuous in the landscape, especially when viewed from public lookouts such as Cape Clairault and Wyadup Rocks." What does "relatively inconspicuous" mean? But although it will not be seen from Cape Clairault Road, many people believe the development could be an eyesore from the beach. Letter 3/11/02 from a concerned community member. Approximate area of location 1351. Most of location 1351 has been gifted for National Park. Cape Clairault Road, the road leading in to Injidup car park. See Map A for more information. (the road down to Injidup Bay). PROPOSED DEVELOPMENT: 10 Suite Guesthouse Plans and details of the proposal may be viewed between the hours of 8.30am and 4.30pm at the Busselton Council Offices, Southern Drive, Busselton. "the community need to be ascertained prior to subdivision approval being issued due to apparent community concern in relation to development along the coast." "Due to its high landscape value, a detailed Visual Impact Analysis of the strata development from several points e.g. Pt. Clairault, Cape Clairault Road, lookout point at carpark (end of Cape Clairault Road). " The application may* be advertised for 42 days, depending upon consent from the Western Australian Planning Commission (WAPC), for public comment. *Within 24 hrs of putting this page up the news is that the WAPC have approved the subdivision with no consideration for public comment despite the recommendations of the Busselton Shire.
" 'xiv) Reference is made to correspondence from the Commission dated 21st December 1997 (Ref: 103087) in which the Commission gave in-principle support to a form of subdivision and development with a "super lot" contained generally within the area known as the amphitheatre. The Commission indicated it would be willing to favourably consider a proposal for a form of subdivision and development that would provide for additional low impact tourist development over and above the proposed 10 houses and guest house, subject to suitable zoning and provisions under the District Planning Scheme and suitable restrictive covenants. The Commission remains of the view that it would favourably consider such a proposal as an alternative to this approval. However, in the meantime, should development of dwellings or the lodge occur on the survey strata lots west of Cape Clairault Road, this is likely to lead to the Commission withdrawing support for the above mentioned alternative'. With respect to note xiv on the original subdivision approval, it is considered inappropriate for this to remain a view of the Commission, which is stated in the subdivision approval. In relation to note xiv of subdivision approvals 103087 and 117-97,that the Commission be strongly recommended not to include such a note in any further approvals, on the basis that this gives the potential of additional development far beyond that already accounted for and negotiated between Council and the proponent. " In other words, the development proponents may have an alternative or "fallback" position if the development of the guesthouse and subdivision of 10 housing lots on the coastal land to the west of Cape Clairault Road doesn't go ahead. The alternative is the development of a subdivision which includes a"superlot" in the area at Injidup known as the amphitheatre in addition to the guesthouse and the 10 houses already planned. This is a strange note to have in a planning document and pretty much seeks to ensure the development of the guesthouse and 10 houses otherwise face additional development in the same area. Busselton Shire Meeting April 18 2001, item 8.1. Shire councillors move to have community consultation included as part of the subdivision re-approval. Recommendations over ridden by WAPC. Why? Well done to the Busselton Shire councillors in recognising the importance of community consultation. The ceding of 630Ha to the National Park is admirable. It is such a good gesture, it probably would have gained broad-based community approval had we the chance to comment. 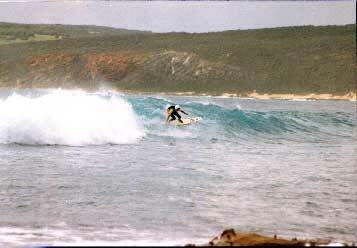 Yallingup Residents' Association chairman Ron Edwards was cautious about the deal. Mr Edwards said he was concerned that part of the development was virtually on the coast. 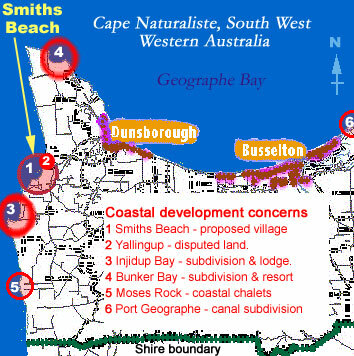 The association preferred all development to be at least 500m from the coast. "There are some sensible elements to the proposal and any land being included in national parks is to be applauded," he said. "But there are some parts where we would have to raise questions." Mr Anderson said the proponents still had the option to make a new application for a higher density village proposal at the site, but would have to forgo the developments already approved. Why then did the WAPC rush the subdivision plan through without community comment in this high value, to the community, coastal area? 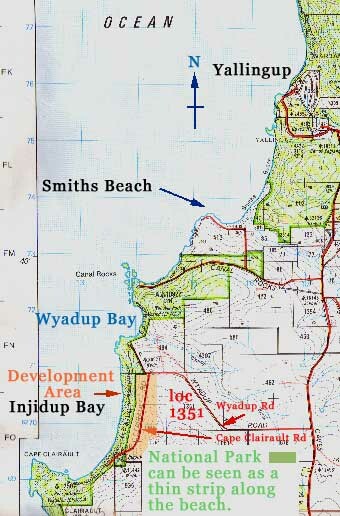 It may seem that the WA Planning Commission has negotiated an agreement that some development right on the coastal edge of a pristine (untouched by human housing development) south west bay is acceptable to the people of Western Australian without full and proper community consultation.